Bring an authentic experience to your next event! 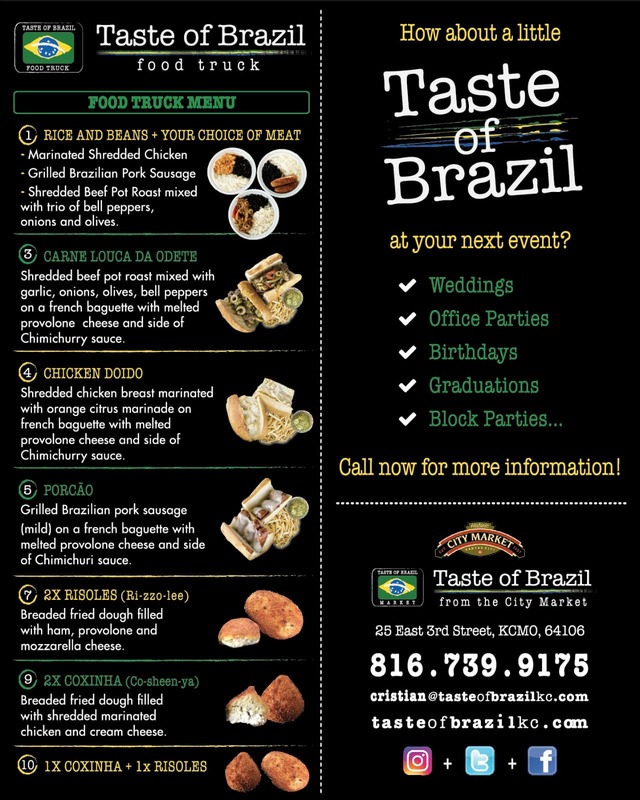 When you’re looking for something special to offer to your family, friends, or guests you won’t go wrong by going Brazilian. People rave about these simple foods because of the delicious flavor. It’s how food should be! More often than not people will take the time to come back to the truck just to say thank you for the yummy food. Served 100 without a single complaint. Our employees loved it. Had the wonderful food from food truck. Great food and very personable servers. Look forward to seeing them again at Somerset Ridge Winery. The food was incredible!! Best food truck meal I have ever had! Very tasty, loved everything I got. My son loved his sandwich! The Prairie village jazz fest featured several food trucks, taste of Brazil was one. The menu items were appealing so why not. She had the pot roast rice and beans while I tried the chicken. We also had couple of fried bread itens with alternately ham and chicken and cheese. We were immediately taken to a heavenly place where food trucks rarely take you. All we could do was smile and chew. Wonderful!! The beef was prepared with green olives and green peppers and was just delectable! ! We will try the main restaurant next and report back. Really good!